This was pretty funny in Starbucks. This guy comes in with a briefcase and sets in down on the table. He opens it up and proceeds to take out an electronic device--turns out it's his laptop computer. So everyone is looking like there really is something to this. You can almost tangibly feel them wondering what the heck type of device is this that he is carrying...it must pack a real punch! 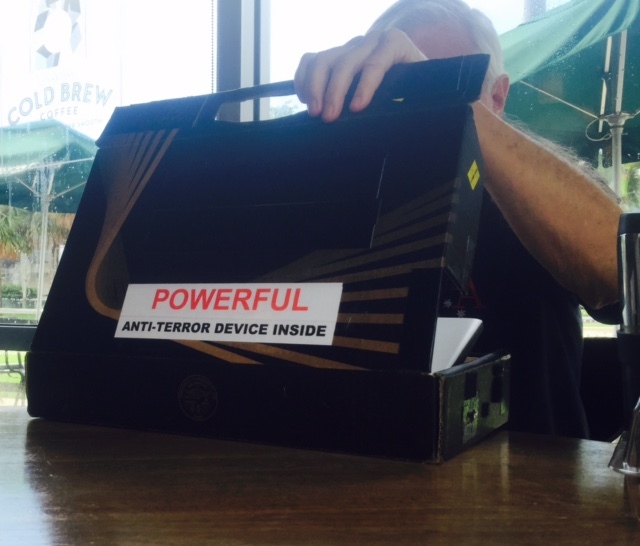 Then one person near me, bends over sideways, and whispers in my ear..."Does he really have a powerful anti-terror device inside?" Like I look as if I'm in the know on these things!!! I lean back over in the other direction to the other person and whisper back, "No, I'm pretty sure that it's just a gag...the guy must be looking for some serious attention." And all of sudden, it's as if all the heads around me start to nod, like I stated some amazing insight here or perhaps that they somehow knew it all along. Anyway, it's incredible what people will believe...if you just state it (in an official way, of course) on your briefcase, a badge, on your forehead or wherever, it's got to be true, because we are so gullible and willing or wanting to believe.